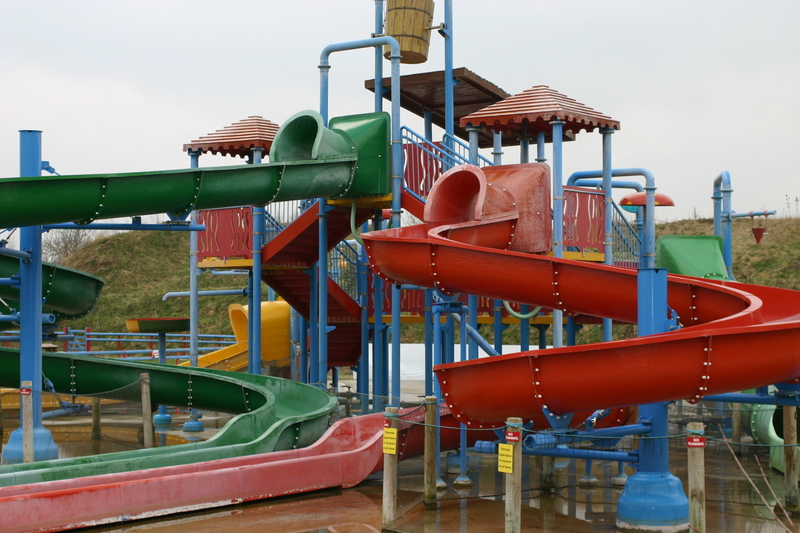 Twinlakes Park is a family theme park near Melton Mowbray in Leicestershire. It is pretty big and you’ll have to rush to get around everything, especially on a shorter low-season day, but you can just pick and choose what you want to. 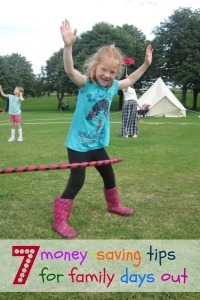 There is lots of things to do for children aged from 2 to 12, and for adults too. Twinlakes Park is a few minutes drive off the A607 North/East of Melton Mowbray. It is brown signposted, and very easy to find. There is a huge, free car park. As we went on a quieter day, the queues were pretty short. Pre-booked tickets were going straight through their own entrance, but #StayPlayExplore tickets have to be redeemed for regular tickets, so we joined the main queue. It seemed to be a lot of people were buying annual passes and the queue was slow at times. It took about 15 minutes to get in, but there were toilets this side, and some characters milling about for entertainment. Ticket booth staff were friendly and helpful, and we got our tickets and a park map soon enough. 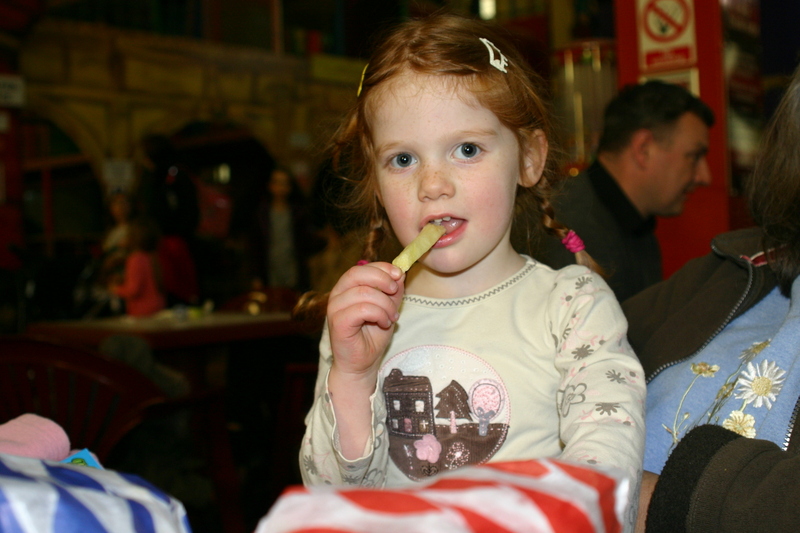 The park consists of a few themed zones with various indoor and outdoor play equipment, rides, and animal attractions. The Jester’s Revenge ride was suitable for all of us (aged four to adults) and is like the tea-cups at Disneyland. Very spinny! 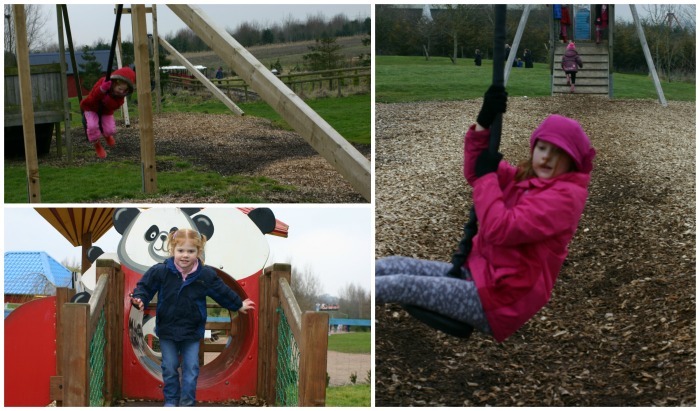 There are lots of playgrounds with a wide range of equipment dotted around the park. 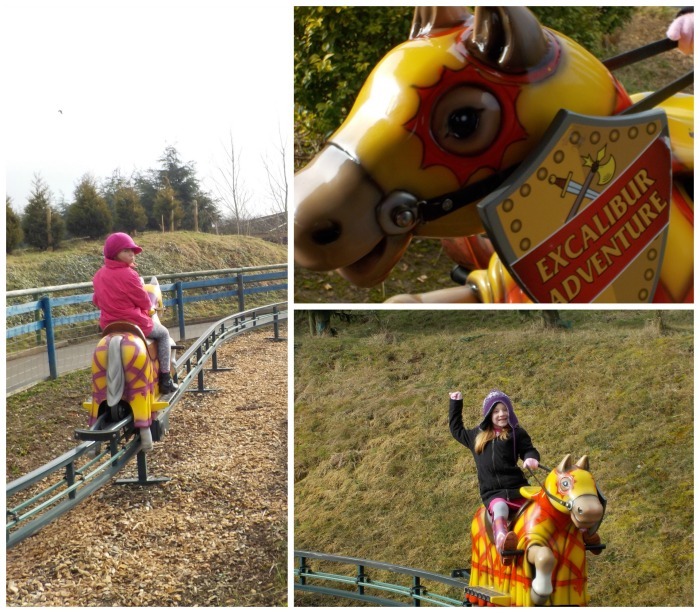 We love zip wires, and Twinlakes Park had lots! The Joust About horse ride was good. It was tame enough for the four-year olds to go on with us adults. 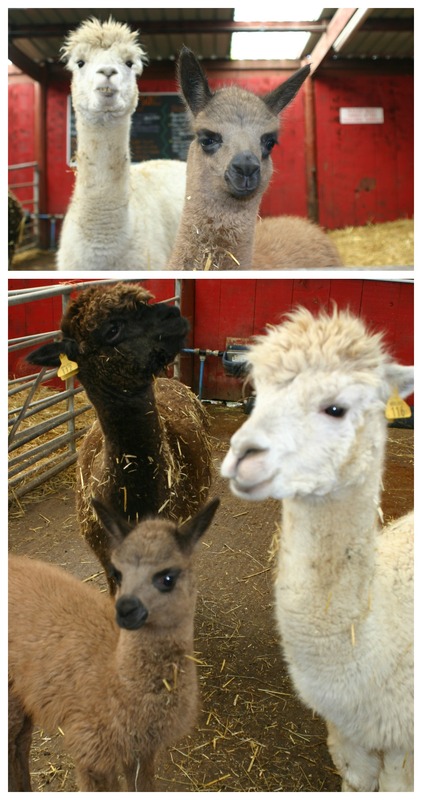 The Red Rooster Farm was full of animals including goats, sheep, alpacas, pigs, and turkeys. They do pig racing, but we were too late for this. 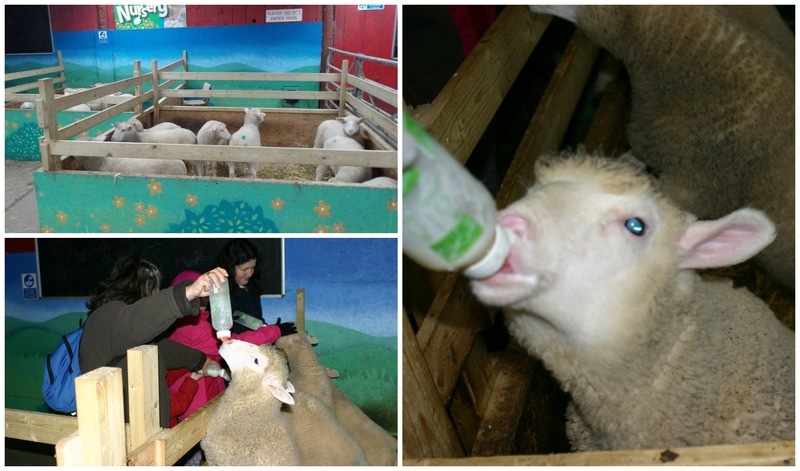 You can feed the very hungry lambs. Visit the gift shop to collect a token. It doesn’t cost extra but they have limited numbers for each session. Go early as we went at lunchtime to get booked in and they only had 4pm sessions left by then. It is very popular. 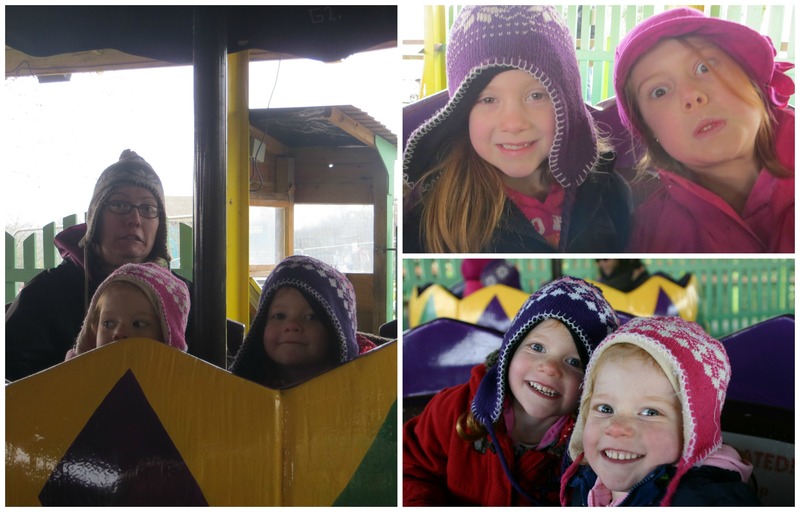 We had a little ride on the mini train, which goes from one end of the park to the other. Then we watched it get turned around for the return journey. 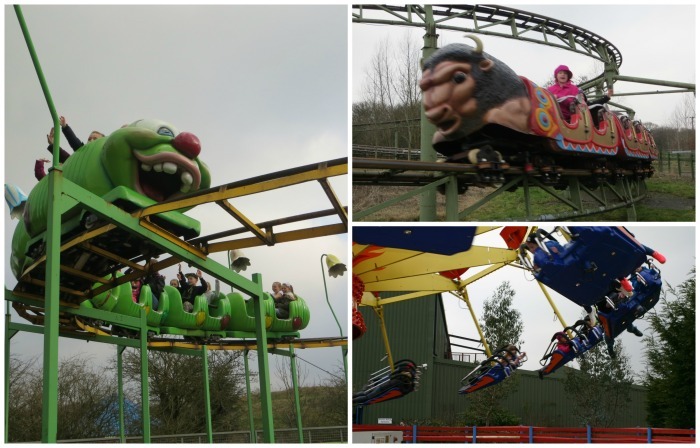 There are lots of family rides at Twinlakes Park, but a couple of ‘big’ ones, including an Icarus Sky Flyer, and the Buffalo Stampede, but they were pretty tame. As it wasn’t anything like a warm day, we avoided anything watery. I bet this outdoor waterpark is fantastic for children on a summer’s day. There is also a log flume. There are more little playgrounds, with more zip wires. And no queues! The staff at Twinlakes Park were helpful and very friendly. 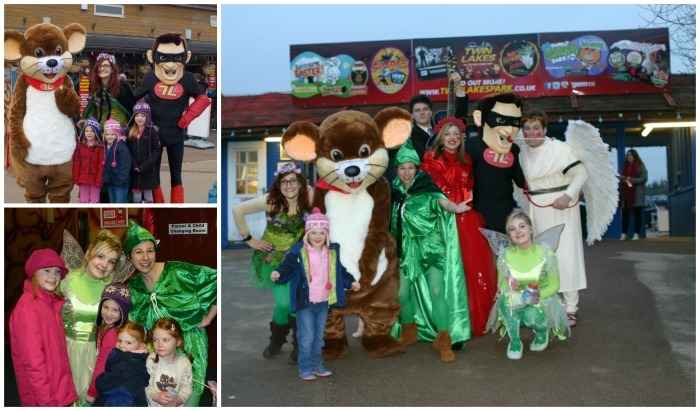 There are lots of characters for your children to meet. There are official photographers on site, and you can buy a photo from the photo shop near Red Rooster Farm. However, they don’t mind you taking your own if that’s what you want to do. Because it was Valentine’s weekend, the characters included Cupid. 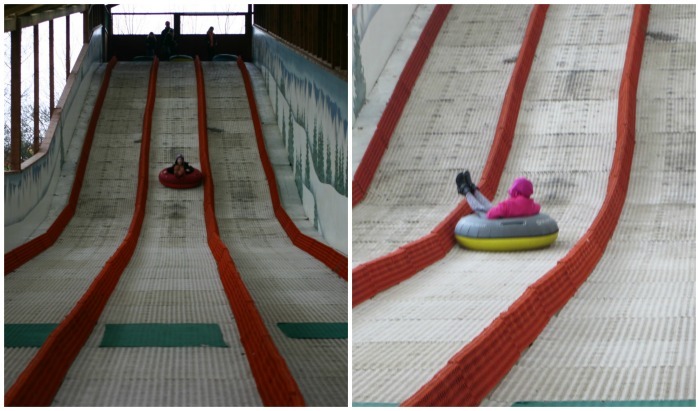 The Alpine Slide was suitable for older children. You collected your ring from the bottom, dragged it to the top and then slid down – wheeeeeee! 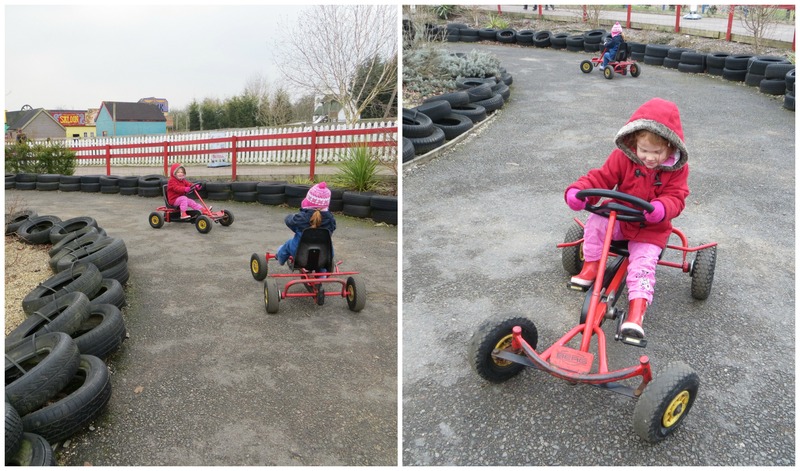 The little ones liked the mini karts. There are two kart attractions – one for little ones, and one suitable for older children. 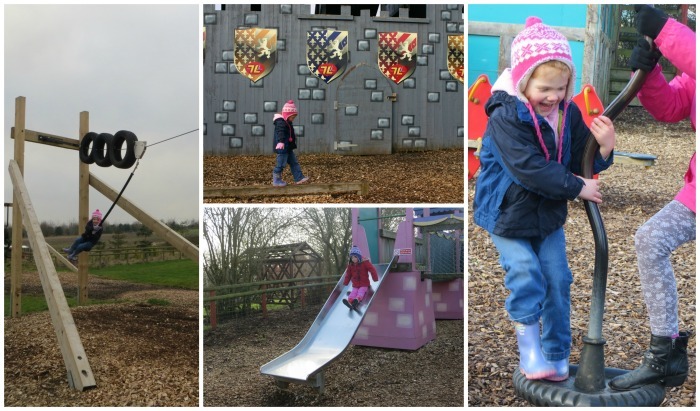 There are a couple of huge indoor play areas, which are fab for a rainy day. Labyrinth Venture Zone includes a few rides, and one of the biggest soft play areas I’ve ever seen. Be warned, if your children are not tall enough you will be asked to accompany them. Buccaneers Island Zone contains one of those run-around and shoot balls at each other type things that usually have dozens of noisy six-year old boys in them. It was a bit deserted when we visited, which was a relief! Both areas contain eateries and places to sit. They also have designated indoor picnic areas here, and in various places around the park. We tried out the burger and chips meals for lunch and they were ok actually. Not gourmet standard but not extortionately priced, freshly cooked, and served quickly. We were at the park from 11am until almost closing time at 5pm, which is six hours. We didn’t get to do everything because there was just so much to do. It was pretty quiet so we didn’t queue for much, and found a table fairly easily in the food court. Toilets were clean enough and there was always some within range when we needed them. The whole park was fairly accessible but the ground/paths were rough in places. As it had been raining the days before our visit, there were lots of puddles about, but nothing that can’t be navigated by small feet wearing a good pair of wellies. 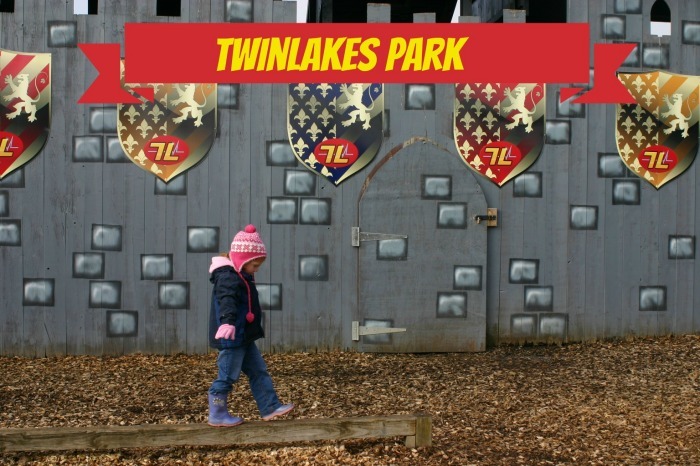 Twinlakes Park is definitely at the family end of theme parks, and there’s not a lot to do for older thrill seekers. 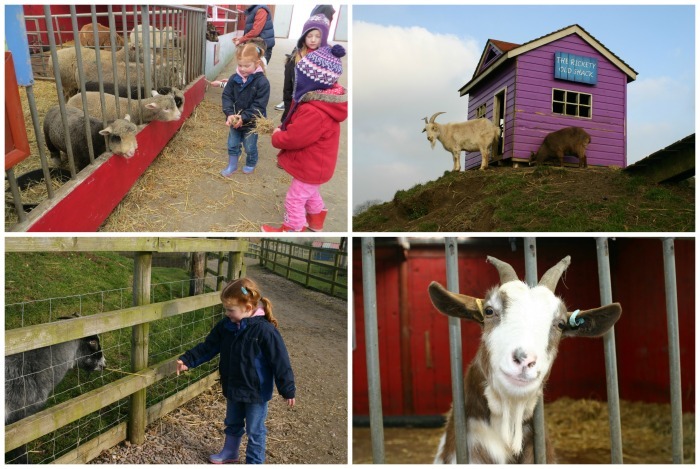 For younger children, there’s loads to do and plenty to see. Think it’s a bit over priced & over rated. A lot of the play areas are ran down & in need of a lick-of-paint. The aminal areas are not well looked after and look ran down. It has potential and could be better. Each time I’ve been, the train has always been out of order and on my last visit 3 rides were closed/out of order. 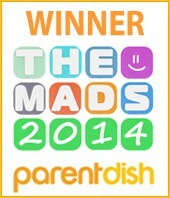 I agree there’s not so much to do for under 2s. And yes some of it was looking a bit tired. But we did have a lot of fun. Shame about the broken rides when you went. Blimey. Twinlakes is huge! It seems to have everything in one spot. 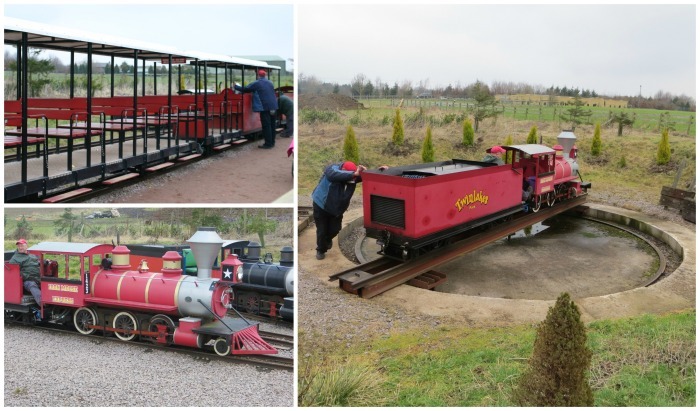 I would have been hard pressed getting Monkey off that mini steam train. Such a shame it’s quite far from us to get too, because it looks right up our street!